ASCOT RANGE- 30% OFF NEARLY EVERY ITEM! DO NOT MISS OUT ON THESE INCREDIBLE OFFERS- UNBEATABLE PRICES! Desk Warehouse are proud to present the Ascot range- stylish office desks & furniture at absolutely unbeatable prices- nowhere has a better price on this professional and modern range! Ascot’s range of work & home office desks are part of a futuristic furniture program for the professional office in the 21st century. 25mm desk tops with 2mm PVC edging offers a durable and stylish solution. Choose from full cable management incorporating steel framed cantilever leg packs or cost effective MFC leg pack options. Ascot is a flexible range of furniture that will compliment any office, and all items are available in Beech and Maple. Bush Europe manufactures and distributes high quality RTA (Ready To Assemble) and case goods furniture for the Soho, (Small office Home office), Commercial and Professional Office, TV and Hi-Fi stands as well as furniture for Lifestyle and Home Entertainment. With a huge range of designer office storage and home office desks with a unique contemporary design and warm feel. Desk Warehouse frequently acquire liquidated and discontinued stock lines and we are able to pass massive savings on these to our customers. In addition we specialise in Office Clearances where customers have either ceased trading or acquired New Office Furniture. At any time we will have at least 500 "previously enjoyed" office desks and computer desks in stock as well as chairs , storage cupboards, executive chairs and other items. Elysium Elysium Managers Coffee Tables and Lateral Filer feature 25mm thick shaped tops with 3mm edging and panel ends. Other options include both mobile and integral pedestals available in either two or three drawer versions. Elysium range available in walnut with black trim designed to make a statement with a blend of style, function and practicality. Flair Our new and exclusive Flair range combines two of the most important factors when looking to kit out your office - quality and price. Not to mention how good it looks!. All items come in a choice of Beech or Cherry. Styled to appeal to traditional tastes, this range is our most popular collection. French Gardens has many bookcase, cabinet, office desk and workstation(computer desk) options in our beautiful Odessa Pine finish.A range that extends far beyond the office desk, throughout the office and into informal and communal areas of any business.The French Gardens collection has style and rustic charm whilst accommodating the needs of any modern business. Printers, monitors, tower CPUs and other office equipment can be used with efficiency while adding an individual statement of style. The French Gardens range is made from Laminated TDF board with a Pine or Oak Laminate. This range is now exclusive to Desk Warehouse. In Common with almost all Office Furniture, The French Gardens range is sold in Flatpack form and delivered to you for simple home Assembly. A full range of ergonomic chairs designed to meet the needs of every modern office, featuring height, back and seat adjustment, back support and lumbar control, and tilt mechanisms. Hille Hille Furniture has had the good fortune to have worked with two of England's most prolific furniture designers. Having produced one of the UK's most well known design classics - the Polypropylene chair- Hille is known to all in the industry as a company of design excellence and continues to provide through new designers, new technology and a wealth of knowledge and continued success. Home Work Space These new classic and urban designs will fit in to any home to create a workspace that works around you. With ranges that include The High Gloss range by Sonix has an urban twist on the classic home office furniture. Sonix Chic a new range with a New England style chic finish. The Adroit solid oak range which has a classical design made from quality sourced solid and veneered oak, natural wood grain with a satin gloss finish. The Imperial range is varied with a vast amount of choice for leg set up, top colour and edging colour. The build quality is second to none with everything being made to order in their own factory in the North of England. Jahnke Media Furniture offers a unique balance of contemporary design with complete functionality, whilst ensuring the highest levels of quality. Stylish and unique media furniture for all modern TVs and Media in classic Black and White glass finishes, bring a modern and classy feel to any living room. Chairs of Kulik System guarantee a complete rest to the spine. The design of chairs repeats the natural anatomical contours of your body, corrects the posture, prevents the occurrence and progression of spine diseases and ensures health and comfort. Lanyon Student Range Our exclusive Lanyon range has the perfect desks and tables for any student. Affordable, quality furniture that will look good, fit in small spaces and won't break the bank. Our Luffield range of low cost Cantilever Desking follow the 'European' sizes i.e. 1600mm x 800mm etc. All workplace & home & office desks are manufactured from counter balanced 18mm foil faced board and edged with a PVC trim to all exposed edges. All steelwork is powder coated 'battleship' grey to create hard wearing and scuff resistant surface. Phase Equip your office today with these desk mounted screens. Screens can be used to create individual workstations and to help reduce noise and distractions in the workplace. Sonix A contemporary range of quality tables, rectangular office desks and chairs that offers both style and practicality in the work space. 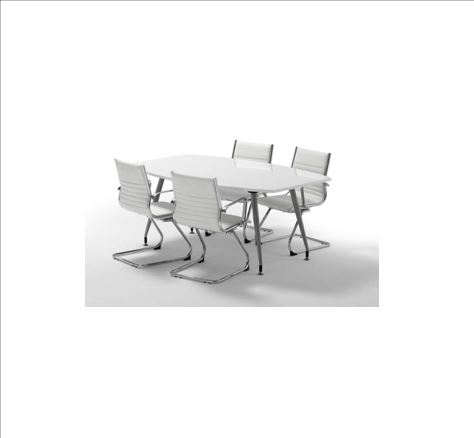 Stirling Range The Stirlings range of steel framed tables incorporates the usual rectangular sizes together with semi-circular, circular and trapezoidal. All units are manufactured from counter balanced 18mm foil faced board and edged with PVC trim. Strictly Range Whatever the location, event or occasion, our folding tables and chairs are the ideal choice for any function or event. Each piece of furniture is built to combine strength, durability and style. All our event furniture is manufactured using the highest quality components. This ensures both longevity and customer satisfaction. Our event furniture is perfect for all kinds of commercial venues including pubs, clubs, hotels and schools. The Office Seating Specialists, Teknik have your perfect office chair. Whether that's leather, fabric or mesh, manager's or operator, sofas or meeting room seats, in any colour you can imagine.. Teknik have it. Check out our range of workstations also- the perfect compliment for your new chair. Traditional solidly built, metal straight leg office desks at budget prices, that's the Trexus way. You can choose from a variety of finishes including Mahogany, oak, beech, and Grey Ash. With a choice of pedestals or secretarial return unit. Woodstock Leabank offer an extensive range of products to suit the majority of tastes and budgets. They continually look to deliver fresh design ideas for any commercial environment from office and atriums, to classroom and conferencing.